Good skin preparation is the key to great makeup. 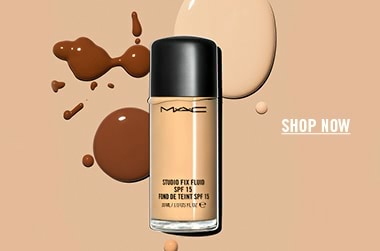 The M.A.C Cosmetics Primer + Skincare range has a variety of solutions for every skin type, helping you to get your best-ever complexion and flawless-looking makeup. Where do I start with M.A.C primers and skincare? I need something to control shine throughout the day. Oily skin types will love M.A.C Prep + Prime Skin Refined Zone, an oil-free emulsion that minimises the look of visible pores, controls oil and reduces shine. The cream formula acts like a powder on the skin and is great to use before applying Studio Fix Powder Plus Foundation. Skin Refined Zone can be used on just the T-zone or all over the face to control shine and oil. For those with dry or dehydrated skin types, try Prep + Prime Moisture Infusion. A lightweight priming serum that saturates the skin with a concentrated dose of hydration, it leaves the skin perfectly prepared for foundation. Skin gets both instant and long-term moisture, so that makeup applies more easily, looks smoother and lasts longer. I need to banish dullness. M.A.C Strobe Cream is a multi-tasking must have. Hydrating and brightening, this lightweight cream also contains iridescent pigments to enhance the luminosity of the skin. Endlessly versatile, Strobe Cream comes in four radiant shades and can be worn on bare skin for a subtle gleam, over foundation to highlight, or mixed in with foundation, primer or moisturiser to give skin a lit-from-within glow. Try mixing Vanilla Pigment with Strobe Cream to create a subtle but gorgeous body highlighter. I need to prep my lips for makeup. Not just about the complexion, M.A.C Cosmetics has got all your lip care needs covered. The perfect pout needs the right preparation - try Lip Scrubtious in Sweet Vanilla to remove any dry, flaky patches of skin for a smoother finish to your lip colour. Lip Conditioner is packaged in a convenient tube and hydrates and softens lips while locking in moisture. LOVE this product! But watch out when you start to run low, the spray can become less fine and you end up with big blobs on your face. I use this to set my make up and make it less "cake" but also on an eye shadow brush before using shimmery shadows to make the colour more intense. I use this product if I plan on wearing lipstick for the night, It takes off that dry skin leaving your lips smooth. I find if I do around 30 minutes before applying lipstick my lipstick does not dry out and go yuck on my lips.